Play in the Sand: Make Your Own Outdoor Workout. Sunny skies make it easy to bring your workout to the beach. Summer in the Midwest seemed off to a slow start with gray skies and less-than-warm temperatures, but then heat finally arrived! Sunny weekends offer many opportunities to get outside, and lake or ocean front locales provide a great environment for a challenging workout. You can use a day at the beach as a means to relax and let go, but find time in between leisurely activities (or naps on a beach blanket) to burn a few calories. Walk, Jog, or Run: Simple as that. Pick a destination and get there at a pace where you are comfortable. The sand is easier on your joints than asphalt/pavement and its increased resistance helps activate and strengthen leg muscles more effectively. Go for distance, time, or try short sprints. Mountain Climbers, Burpees, & Pushups (Oh My! ): These three moves all help strengthen the upper body and core. 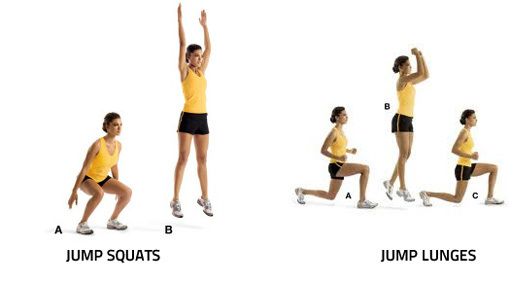 Mountain climbers and burpees (also called squat thrusts) elevate your heart rate to provide a cardio vascular workout. Pushups are always in fashion. Modify pushups with knees on the sand to help maintain proper form and alignment. Check out this article for some quick tips. Squats and Lunges: Performing squats and lunges sans weights is highly effective. Your body weight combined with higher repetition/volume can really pack a punch for developing a stronger and more toned lower body. Variations on these movements are ample. Add speed, asymmetrical foot positions, or plyometrics (jump squats, jumping lunges) to really fire up these moves. Sit Ups, Crunches, & Planks: Core standards. Mix them up and enjoy the support of soft sand. Animal Moves: Bear crawls, crab walks, inch worms, duck walks, and frog jumps are not just for kids. These body weight moves employ strength, flexibility, and agility. They might initially seem silly, but once you get moving you will find these exercises truly challenge the entire body. If you are not familiar with some of these creative modes of exercise, look them up online. Swimming: It might appear obvious, but don’t forget about moving around in the water. This is also a great way to cool down or rinse off post workout. Bear Crawl from point A to point B and Crab Walk back to point A.
Frog Jump from point A to point B and Inch Worm back to point A.
Repeat this series for up to 3 rounds. Now cool off, hydrate, and relax. There are many ways to take advantage of your surroundings and get fit. Let the beautiful outdoors be your playground! Drop and Give Me Twenty! Why Pushups are Good for You.